Quess Corp is a Technology Services, Staffing Services, Industrial Asset Management and Facility Management provider. The company is listed in July 2016. Lets analyse Quess Corp on Technical Chart from short term trading perspective. After its listing in July 16 the stock was trading in a broad range. This range is between 520-630. We know breakouts can yield fast gains if traded with proper risk management in place. For those who are new to Technical Analysis- breakout is a large movement in price couple with high volumes taking stock to a new trading range. 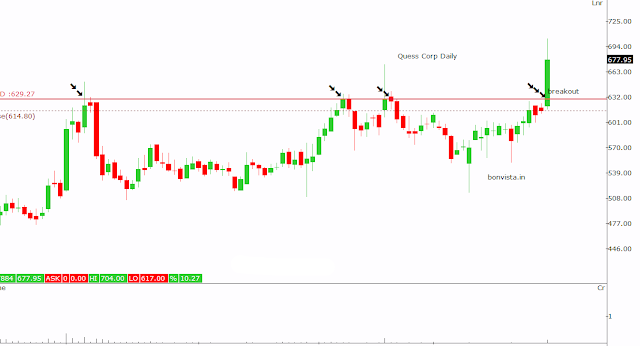 Here are two different chart views of Quess Corp. Both the views are on Daily time frame. The first chart below is closer picture. Two things to observe here. 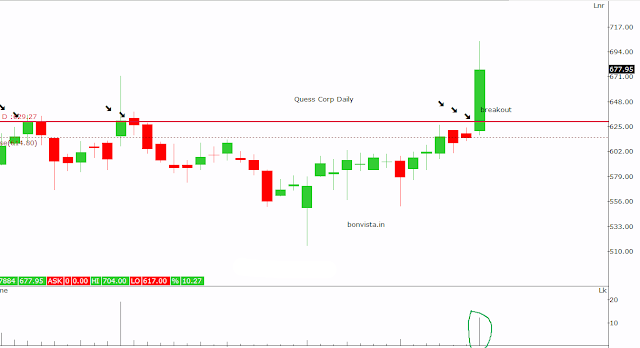 (1) Today dated 29 Nov the stock has taken out an important resistance near 630. (2) The volumes are substantially higher as compared to the volumes in recent past. The second chart below is a relatively larger picture. On the larger picture here are the observations. (1) There are 3 failed attempts to breach the resistance near 630. First attempt on 5 Aug 16, second on 7 Oct 16 and then on 21 Oct 16. All the attempts failed to take the stock to new highs. However these repeated attempts weakened the resistance. (2) The stock after its listing in July 16 has never traded below its listing price. Based on above analysis our Premium Subscribers are recommended to buy Quess Corp. The detailed money management parameters like % of total trading capital to be utilised, Entry points and Risk Management parameters like stoploss multiple targets are updated to them. Here are basic exit levels for all the readers. I had recommended a Buy in UJAAS to my premium subscribers on 28 Nov. The stock is now trading with a gain of 10%. If you wish to regularly trade fast moving Mid and Small caps along with regular update/view on Nifty, subscribe to my Premium Services here.